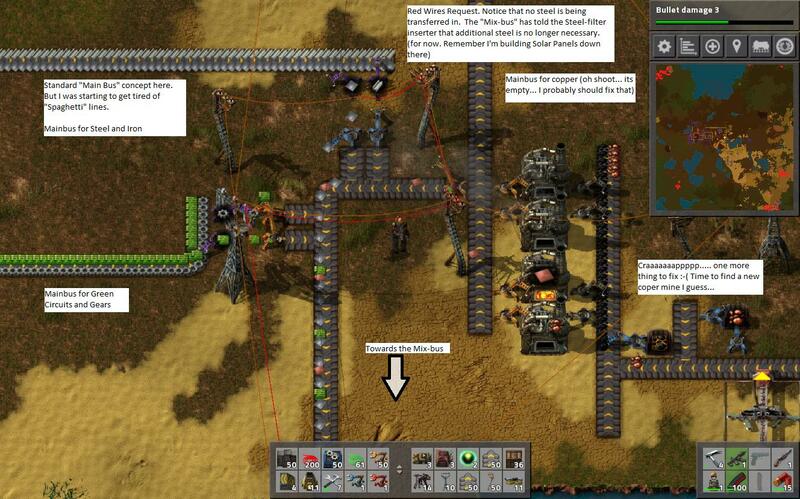 Wow, the more I play Factorio, the worse I get at writing. I have edited my this post and put most of it behind a spoiler... because its long and redundant. I decided to play with the Red Wire / Green Wire / Combinator stuff and came up with a "flexible factory". 1. I'm still relatively early in the game (haven't gotten to any petroleum processing). I probably should advance... but I'm having fun with this. Restarted the game on my laptop because I was away from my desktop. My laptop is able to play this game just fine (woot woot). 2. I created a "central storage" bank of boxes (they'll have to be "smart chests" in 0.12... but all chests are "smart" in 0.13, so I just use wooden chests). EVERY item gets its own chest and a filter-inserter to ensure that the chest remains purely of that item. All chests are wired to the "Green" network (all items in green network are added together). 3. I have a "filter belt" which feeds the central storage inserters. The filter-belt is a large loop, so if an inserter "misses" an item, it will eventually loop around and get a 2nd (or 3rd, or 4th) chance to pick it up. 4. To ensure the "filter belt" continues to move, items are ONLY inserted into the filter belt if (Green Network: Item < 0). I hook up a series of green "Constant Combinators" that set negative values for specific items. 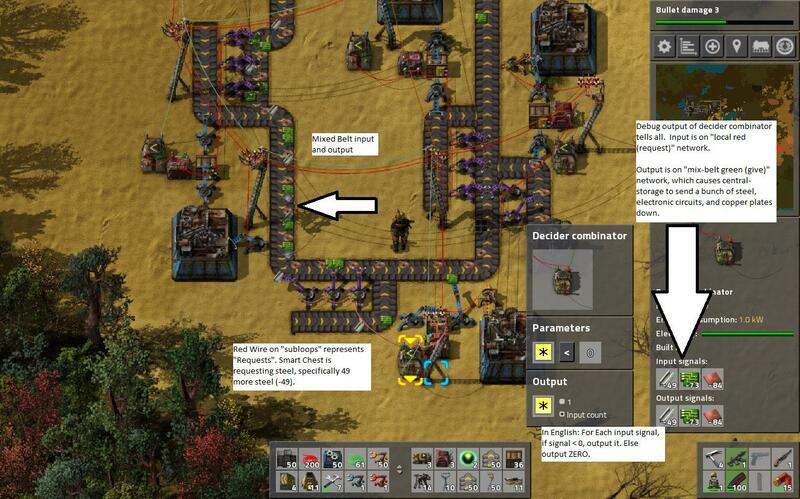 (For example: if I want the network of smart-chests to have 1500 copper, I set the constant-combinator to -1500 copper. Up to 15 different items can be requested per constant combinator). 5. I have a "Output network", consisting of Red Wires. The idea is to have an ideal "slush" of mixed output on the singular belt. This does work out, but in practice my current design is very slow. I'm currently thinking of improvements. Some basics: Every 4 belts are connected to a 2:1 joiner to ensure that the "slush" doesn't block all of the other inserters. 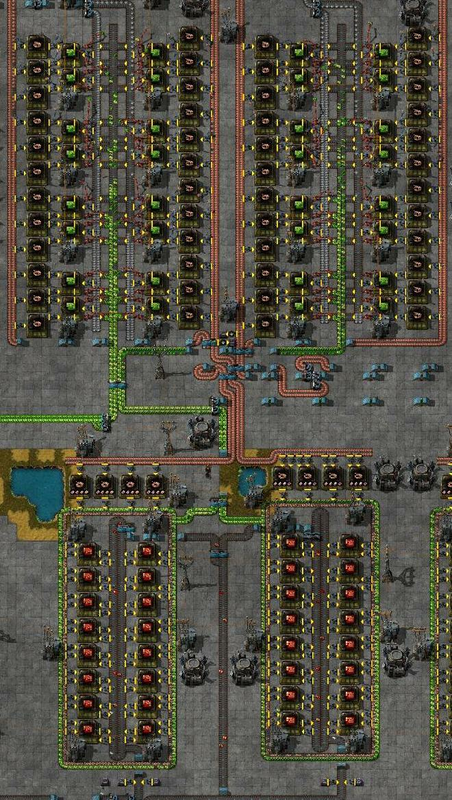 Ex: If I set the Red-network combinator to -15 copper, -20 iron plates, -15 gears, and -15 green circuits: the red-wire inserters (which are removing from the "smart storage") will continuously output. This uses the 0.13 feature where you can hook up red (or green) wire to a belt to count the number of items on the belt. 6. Aside from Iron, Copper, Green Circuit, Gears, and Wire production, ALL of my automated production is in this "output network" ring. "Well-mixed Slush" on the right-side of the belt, "Factory output" on the left-side of the belt. Science labs are positioned on the "left" side of the belt (since they have no output, they'll never have to worry about the "input-slush" blocking them), while all factories are on the right side (to ensure that the "output" lane for all factories remains open). The only way a factory "shuts down" is when their associated "out inserter" (from the green network) detects an overabundance of a particular item. The output network works pretty well, but my current design is redundant and hard to setup. You need to set ALL of the belts to be on the red-network, then set them to "count", then disable the "enable/disable" switch. Its relatively slow and takes a lot of twerking to make the "output mix" just right for optimal performance. Even then, I find myself feeding the factories manually a lot of the time. But the "filter belt" and "central storage" bank are extremely useful, especially since I managed to get it "blocking". When the chests fill up with 1500 Iron (my current set amount), the iron processing "backs up" and eventually automatically shuts down. It becomes very easy to see which items I have in excess, which items I have "excess storage" (but not excess production). I think the design of the "central storage" and "filter loop" are solid, and I'll be constructing this every game from here on out. Its just super-useful to have one location keep track of all of your excess output. Long story short: I figured out how to use red-wire / green-wire circuits to make "long-distance" backpressure. My long-term hope is to simplify down a lot of factory design to use fewer transport belts, and instead use a single "mixed" transport belt for a lot of demand. For backpressure, I generally have my outputs going into the logistics network (or onto a belt that feeds into the logi network) and use a filter to cap the amount that can go into the network. Are you using a main bus? Izawwlgood wrote: For backpressure, I generally have my outputs going into the logistics network (or onto a belt that feeds into the logi network) and use a filter to cap the amount that can go into the network. I'm attempting to do something that few others have done: mixed-bus. Put all the crap on one transport belt. Run that single belt around the base. Certain items will be on a "main-bus lite" (ie: Green Circuits have so much demand that I have a dedicated green-circuit subfactory). But the vast majority of assemblers will be on this slower, but more convenient mix-bus design. To do this, "back-pressure signals" needs to be wired across long-distances, which requires copious amounts of green and red wire. I've built approximately three prototypes of this sort of system already, and each time the system gets faster, more responsive, and uses less space. * Version 1 only worked in 0.13 and sucked. Its basically the n00b post I made earlier. I did discover the practical uses of a "Constant Combinator". * Version 2 would theoretically work in 0.12 (although it'd take more resources). Still sucked in practice... but "Smart Chests" and "Smart Inserters" will form the basis of my design. * Version 3 added buffering to deal with the latency of long-distance "requests". I formalized "long-distance backpressure" as a concept in my brain and built designs around it (V1 and V2 implemented the concept... just inefficiently. When you give a concept a name, you're able to better optimize a design). I discovered the practical uses of Decider Combinators here. Basically, I'm formalizing the concept of "Downstream Backpressure aka Gives" (information transmitted on Green Wires), and "Upstream Backpresure Release aka Requests" information transmitted on Red Wires: Requests). Do not give to a mixed-belt system unless you are satisfying a request. The key of course, is creating the right logic (and the right system overall!) that prevents "overflows" where the belts get clogged. Which will allow multiple-mixed belt systems to interact with each other (in theory at least). The "network split" effect of decider combinators is key to Version 4 design... and I didn't really understand it till version 3. If I get Version 4 working well, I'll share the design, because then it'd be practical. Versions 1 through 3 aren't really worth talking about yet in detail (V 3 is really close to being "practical". There are just... a few more issues I need to iron out.). Chances are however, that I'll discover another fault in the design and have to make V5. And because I spent so much time playing with failed "mix-bus" designs, my evolution factor has kicked in and medium biters are now attacking... and I don't even have petroleum researched yet. I'm also very low on Iron Ore (although I have well over 2000 Iron Plates in "central reserve" and roughly 2000 Steel plates as well... a lot of "thinking and rebuilding" time with the above prototypes). Last edited by KnightExemplar on Tue Jul 12, 2016 11:01 pm UTC, edited 2 times in total. By mixed bus, do you mean you push your outputs along the bus as well? Because that's pretty normal I think. Izawwlgood wrote: By mixed bus, do you mean you push your outputs along the bus as well? Because that's pretty normal I think. And of course, the output bus (left-side of belt) is mixed as well... consisting of... well... everything. Engines, pipes and more. My V1 was everything was mixed together and that was still to chaotic. Focusing on "Rapid Prototyping" with just seven inputs on one line has allowed me to iterate through designs faster. When I get a fully practical setup, I'm going to build a "master" mixed bus consisting of all items in the game. Last edited by KnightExemplar on Tue Jul 12, 2016 8:11 pm UTC, edited 2 times in total. like, all those things on a single belt? The main bus set up that i've always done starts with copper/iron plates, and by the end has almost all the inputs. For more esoteric stuff, I just use logi. Izawwlgood wrote: like, all those things on a single belt? Yes. Even my V1 prototype demonstrated that this can work... albeit ridiculously slowly. V3 is fast enough for practical use, but is not extendible. I need to create V4 so that I know how to transfer items between mixed-belts. Because what's the point of a single mixed-belt system? That's a curiosity. I need to know how to build mixed belt systems so that they can build off of each other. I would think this would depend greatly on how fast you intend to finish the game. The longer the game goes on, the more you start to run out of resources (mostly iron, in my experience) and have to set up new mining sites. I found you get a lot more efficiency from sticking with 1 resource per belt, and running the "main bus" of iron plates, copper plates, steel plates, and copper cables along a relatively straight path. Then build your automation of everything else off of that and tap off the "main bus" as necessary with a splitter assembly that pulls off 1/8 of the product. This might not be the most efficient, but it's the way I was able to easily organize my resources, maintain a back-pressure, and keep track of everything that's required to make it past blue research. Can you provide a screen shot, I'm curious how this works. Because the way I see it, any unequal consumption from this belt means you're going to end up with clogging. I mix belts all the time, but only insofar as mixing left and right. Obby wrote: The longer the game goes on, the more you start to run out of resources (mostly iron, in my experience) and have to set up new mining sites. I'll screenshot when I have something that works 100%. V3 is the best I got, but its... still a crappy design. 1. Minor-clogs are cleared out by looping back to the "central storage system". (Minor would be ~500 oversupply on a mixed belt). I mean... I could screenshot this... but that's not the "hard" problem. 2. The "hard" problem is preventing "major clogs" (ie: any oversupply greater than 500 items). This is solved by ONLY placing requested onto a mixed-belt. Consult the red-wire for requests. If the mixed-belt is requesting an item, place it on. Otherwise, stall and create backpressure. The circuitry behind the "Red-wire Requests" system is basically red-wires on all central-storage boxes, with constant-combinators set to negative values to indicate demand. (-800 Iron in a constant combinator). For example, if central-storage has 700 Iron, 700 + (-800) == -100, which indicates demand on the mixed-belt system. Obby wrote: I would think this would depend greatly on how fast you intend to finish the game. The longer the game goes on, the more you start to run out of resources (mostly iron, in my experience) and have to set up new mining sites. EDIT: And.... I think Red-wire requests / green-wire gives isn't going to work. Uggghhhh... I'll have to figure out a proper design so that these mixed-belts can work off of each other. EDIT2: Actually, maybe I can get it to work, but various assumptions have to change (and the layout of V3 has to change a little bit...) But yeah, that's why I'm "prototyping". Until I get all these issues worked out, I really dunno if I want to share an incomplete-solution. I'm feel like I'm really close to a fully extendible, on-demand mix-belt system built up on early-game tech (just green wire, red wire, constant combinators, and decider combinators, and belts). Izawwlgood wrote: Can you provide a screen shot, I'm curious how this works. Because the way I see it, any unequal consumption from this belt means you're going to end up with clogging. I mix belts all the time, but only insofar as mixing left and right. Now that I actually have a working system, yes, I'll honor your request. V4 works, and lives. It is glorious. I have to cleanup some bits and pieces here and there, but I'm feeling pretty great at my accomplishment. In this first picture, I'm building solar panels from that line. I'm also building fast-inserters and filter-inserters all along this mix-belt assembly line. In any case, any factory connected to the mix-belt needs to follow a protocol: do NOT output from the factory unless "Red-line Request" asks for a specific item. Finally, I need to interface to the Mix-belt system. To "Request" for more items, I use a Decider Combinator with logic "For 'Each' < 0, output Each". I connect the input to the decider combinator to the red-wires in this "sub network", and the output to the "Mix-belt Green Give" network. DO NOT "give" the solar panel UNLESS "Mix-belt Red Requests" network is explicitly asking for a solar panel. This is basically "remote backpressure" on behalf of the mix-belt. The important thing to note in this picture is the Constant Combinator, which is setting the network demand. At least 50 Blue Inserters will be buffered here, 200 yellow inserters, 800 Iron, etc. etc. The Constant Combinator value of -800 is added to all of the boxes. If I have say... 700 Iron in Storage, then 700 + (-800) == -100, which is transmitted as a request for 100 more Iron (negative value) along the red network. ALL items in the mix-belt eventually return here, to the master sorting arena. To prevent "minor overflows", the sorting network always accepts input (and is not connected to any storage at all). Finally, we have the connection of the mix-bus and my main-bus. As noted before: Green Circuits are in incredibly high demand. I have a dedicated main-bus elsewhere building green circuits constantly. Any high-value items will continue to use the main-bus concept, but the majority of my automation machines will use the mix-bus for convenience. Here, you can see the "logic" where Red-wires (Red == Receive) are hooked up to the main bus. Because EVERY inserter that potentially inserts into the mix-belt checks Red Wire before inserting, I prevent "major overflows" from occurring. Because this is "upstream", there is no need to run green wires in this direction. 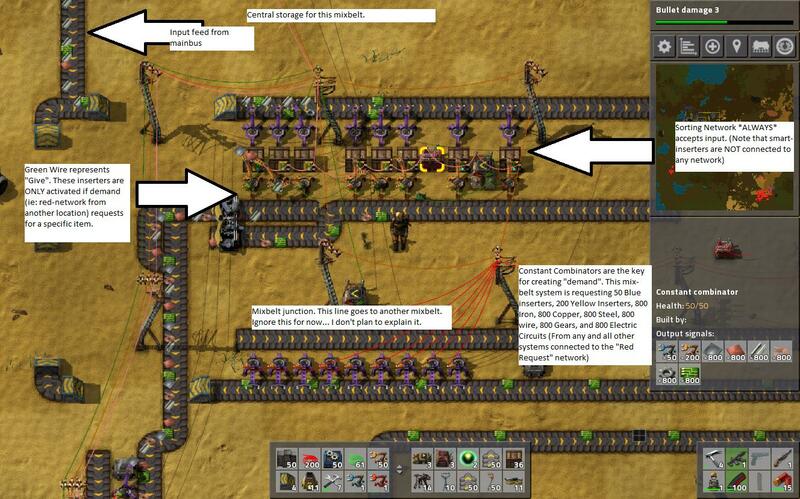 The "Main Bus" only cares about the "Red Request" wires: when an item is requested, the main-bus inserters will transfer the appropriate item over. Wow, that is complicated and cool. I have never seen that before. Izawwlgood wrote: Wow, that is complicated and cool. I have never seen that before. Although "complicated", the system really is just "remote backpressure" implemented with the "combinators circuits" and filter-inserters. With that said, its a lot of effort to replicate what is already automatic in the game. In the general case, I don't think mixed-belts are practical. I blew out my science-production loop last night, and replaced it with a mix-belt solution. That was... unnecessarily complicated. It works, but it took far more effort than it should have. Maybe this calls for a V5 prototype: something that simplifies the design... or maybe I don't understand the benefits of what I've created here yet? I felt like mix-belts were very useful when I laid out Solar Panel, Railroad, and Pipe production. But they were horrible for science. Last edited by KnightExemplar on Thu Jul 14, 2016 3:38 pm UTC, edited 1 time in total. Right, as you mention, it's something that logistics basically already provides, but you figured out a pretty clever work around, and to boot, are using a pretty complicated mixed belt system. That's neat. 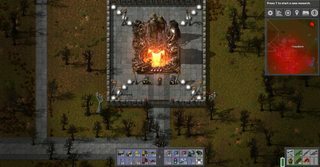 I saw a post on /r/factorio yesterday wherein someone had built a smelter system that works from trains. As in, trains load up on iron or copper ores at mining outposts, then come into the smeltery, and smelters directly pull from the train cars, smelt, and load back to the train cars. The train then goes to a different part of the map to offload the plates. It's obviously not particularly efficient, but it's a neat design nevertheless, and if you expand it out sufficiently, not terribly ineffective. Izawwlgood wrote: Right, as you mention, it's something that logistics basically already provides, but you figured out a pretty clever work around, and to boot, are using a pretty complicated mixed belt system. That's neat. Still, I'm a power-gamer at heart, so I want an effective technique. Not something that is merely interesting... It doesn't necessarily have to be more efficient than the mainbus layout. But it should at least allow me to layout the assembly machines in a way that makes more sense (before Logistic Robots anyway). I think I'll have to adopt the main-bus approach to get a lot of things done. But the "mix-bus" can be used for less common parts: like inserters, gears, copper wire, engine parts, pipes, and the like. It's almost always a bad idea to put copper wire on a belt, since they take more belt-space than the copper plates they're made from. Any sort of bigger base basically requires you to produce copper wire on-site unless you want multiple belts full of copper wire. Here's the design I've been using (I extracted it from a showcase of my last-patch base I made a few months ago). You want a 3:2 ratio for green chips. I seem to have taken the shot during some sort of plastic shortage, but the red chip factories normally have plastic on the outer side of the inner loop, and red chips on the inner side of the loop, and then splitters extract only the red chips. For my main bus I've been producing most t1 stuff next to the assemblers that require them. Gears for example are super easy to make, so I don't see a reason to bother running them on belts all over my base. As YSN mentioned, this is even more true of wires. And dude, glorious circuit setup. I've finally achieved "Blueprints" and "Deconstruction Planner". Its so much easier to build designs now. Which really sets me up to play with V5, except each time I come up to the V4 design, I realize that I need more solar panels, and the factory has 50 waiting for me in my pickup box. So I pickup the 50 solar panels, which automatically starts up the entire "mixbus line"... which awes me significantly. In essence, my V5 design will revolve around a "Mainbus of 4" with Iron, Copper, Steel, and "Mixbus" as the four lanes. I've played with logistical bots, and its clear that they will need a significant amount of upgrades (movement speed, carrying capacity, and just a ton of them in general) before they overtake the mixbus design. Furthermore, Logistical Bots work best when they don't have to move very far, so they're ideal for the "sorting" routine (active provider box at the end then request box for the inserters that feed the mixbus). Izawwlgood wrote: For my main bus I've been producing most t1 stuff next to the assemblers that require them. Gears for example are super easy to make, so I don't see a reason to bother running them on belts all over my base. I've begun testing out V5, which involved resetting the game for peaceful mode. Damn buggers / spitters were getting annoying, and I'm still not 100% sure what I'm doing from a building perspective anyway. Peaceful mode is a lot better for testing out ideas and concepts. V5 is a hybrid approach between "Mainbus" and "Mixbus". The factory is laid out horizontally with four central belts: Steel/Copper, Iron/Iron, Mixbus-Return, and Mixbus Give. I also am laying out green-wire across the "Mixbus Give" section, to keep track of which items are "in-transit". I've got 13 tiles "reserved" for the bus and "bus logic". (Ex: Converting the Steel/Copper and Iron/Iron line into Iron/Copper through underground belts and splitters): 4-tiles for the four belts, 3-tiles above, below, and between for underground belt shenanigans. While wires do go onto the Mixbus on occasion, I've made Copper->Wire assembly machines where large amounts of wire is needed. However: Green Wire and Red Wire are built in small enough quantities that I do not want to create a sub-factory of wires (or green circuits). Its far more convenient to "leech" off the mixbus and excess production of wires elsewhere in the factory, and have space-savings for my Green Wire / Red Wire subfactory. Between the Iron / Copper / Steel "main-bus" and "localized production" of Gears and Wires (and even Green Circuits / Red Circuits sometimes), the Mix-bus doesn't get too much use typically. But daaaammmmnnnn... is it convenient for a lot of things. The singular Mix-bus regularly sends shipments of Yellow Belts, Red Belts, Yellow Inserters, Blue Inserters, Yellow underground Belts, Yellow Splitters, Engine Parts, Plastic, Batteries, Solar Panels, Yellow Weapons, Shotgun Pellets, Red Weapons, Solar Panels, Medium Electric Poles, Large Electric Poles, and small amounts of Wire, Gears, and Green Circuits (Most Wire / Gear / Green Circuit production is localized however). The reason why "end-products" like Yellow Weapon, Red Weapons, Solar Panels, Medium/Large Electric Poles feed into the MixBus is because the MixBus has a great amount of potential for "backflow". The Electric Poles and Solar Panel Assembly machines are "lost" in my factory somewhere: I forgot where they are. But I know that they'll drop 50-Medium Poles and 50-Solar Panels into the box if I ever take the Solar Panels / Poles out of the pickup box at the end of the Mix-Bus line. The rest of the intermediate products (Yellow Belts, Yellow Inserters, Plastic, Batteries...) aren't shipped off in great numbers yet. I know Plastic and Batteries get a lot of use and I may need to run a "main-bus" line of that eventually. But this restarted game is still relatively early. For now, its definitely superior to have these items on the mix-belt. TL;DR: Mainbus with "Localized Production" + Mixbus works much better than I expected. Just to check - by 'set filters' you mean you didn't know that Filter Inserters or the Logi Network could be set up with item filters? Izawwlgood wrote: Just to check - by 'set filters' you mean you didn't know that Filter Inserters or the Logi Network could be set up with item filters? I knew about the filters. That's the point of filter inserters over blue inserters. 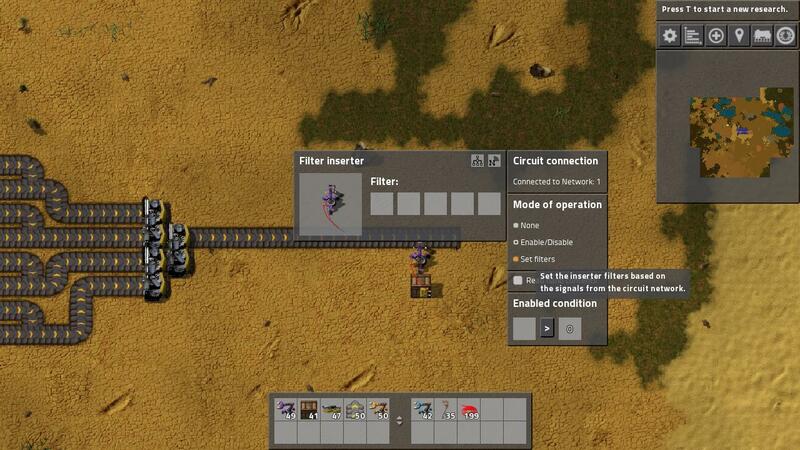 What I didn't know is that circuit networks can programmatically set filters in 0.13. I've basically been just using "Enable/Disable", and just never noticed the "use circuit network to set filters" button. It seems to work whenever a "positive" value is set on the circuit network. That would be useful in a number of my designs. This means that I basically can simplify my V3 design down: instead of using multiple filter-inserters per factory, I could use a filter-inserter and a negative-multiplier with the smart-chest. As far as my V5 game... peaceful mode is way too boring. I returned to my other game and decided to just spend ~4 hours establishing a huge perimeter around my base. The perimeter is 100% solid. I used roughly 2000 stone walls to establish the perimeter, even though the vast majority of it is natural borders (water or forests). While a dedicated attack would be able to get through, the turret coverage is 100% complete. Based on the number of radars it takes to cover the area... I estimate an area of roughly 1300x1500 tiles within my 100% walled off and laser-protected perimeter. I've run the math: I don't think my sparse laser turrets will be enough to handle endgame behemoth biters (5000 HP? holy crap). However, the forest line naturally absorbs pollution, so I don't expect any attacks to come from there. For now, medium biters are still the most common (although large biters are seen a lot now). So my evolution factor is getting close to endgame. I estimate literally a million tiles inside my perimeter. Now I can start thinking bigger designs without worrying about those damn bugs. Also, there's a petroleum expansion a little eastward with 15-oil wells on it... all 50% to 70% yield but outside my perimeter unfortunately. Once I get that, I think I'll be able to go for my first rocket launch. 1000x of each science, 10,000 Solid Fuel (1000 Rocket Fuel), Light Density Structures (10,000 Steel, 5000 Copper, 5000 Plastic), 1000 Blue Circuits, 1000 Speed Module 1... and that's just the rocket (let alone the Silo and Satellite)! The game definitely is forcing me to "scale up" (I understand why there are so many greed / red / blue circuits in "You, sir, name?"' picture now). I think I'm being forced to actually craft a rail network, which is intimidating as well. All of the trains have a dedicated cargo wagon right now, but I doubt that is going to be sufficient for a rocket launch. 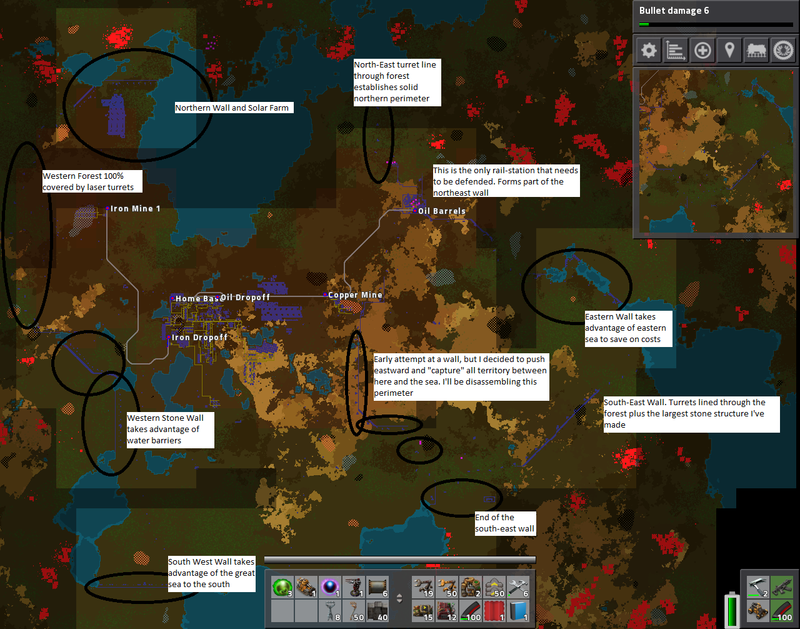 Only a "real" rail system could connect the ~8 copper mines and ~5 iron mines within my perimeter and then feed my factory. Launched my first rocket. Made a new game to test an early-game strategy, and was surprised at how ridiculously efficient it was... so I kept going. * Sub-factory 3: Assembly Machine 1 / Assembly Machine 2, Electric Mining Drills, Radars, Iron Boxes, Pipes, Underground Pipes. Notice a pattern? Iron / Gears / Circuits are common to all the above items. So I only needed Inserters / Long Inserters along two yellow tracks feeding each subfactory to get all the early-game items I needed. Green science was a simple tap out of Sub-factories 1 (yellow inserters) and 2 (belts). The whole scheme broke down into utter spaghetti by oil however, where I'd make short-term decisions constantly. If I knew that I'd launch a rocket in just 17 hours, I'd have stuck with steam power (I had plenty of coal) and I would have made a simpler train system (I only had 4 outposts, three of which were oil and one iron expansion. A single double-header train-track could have handled the oil load easily, and a single double-header train could have handled the iron expansion). I also detoured into Construction bots, which was convenient but probably a waste of time for a quick-run (I was going for Logistic-robot ban achievement btw). And then I probably would have had a sub-15 hour launch... hmmm... I'm just sad at how close I was to the 15-hour achievement. Now that I'm post-rocket, I've been figuring out exactly what I want out of my base. 1. As usual, I'm clearing out a huge region to make room for large-scale designs. 2. I want an "intermediate hub". My basic design is to take Plastic, Solid Sulfur, Iron Ore, and Copper ore as inputs. Then, my "intermediate hub" will deliver Iron Plates, Copper Plates, Steel, Gears, Green Circuits, Red Circuits, Blue Circuits, and Batteries to the rest of my base. With long-range train "backpressure" to prevent overproduction (mostly: trains delivering say... Gears... would "wait until empty", and "wait until full" between the hub and the main-base). Naturally, this hub would be a mini-base of its own with a large train-station. So I got this game yesterday. I have beaten the campaign thing and have played 15 hours already. Need I say more? Eomund wrote: So I got this game yesterday. I have beaten the campaign thing and have played 15 hours already. Need I say more? Welcome to your personal Lotus Eater Machine Mr. Bones Wild Ride Sisyphusian Hill Digital Crack Den. We wish you a pleasant stay. Don't forget: You're here forever! On a side note: In order to motivate myself to actually launch a rocket at least once, I took my furthest advanced single player game and opened it up for multiplayer. Yeah, didn't work out. Public multiplayer hasn't really improved in the last, uh, fifteen years. Does anyone remember MUDs? Were those just as awful? That last campaign mission nearly got me to quit the game forever. I ended up just using cheats. I just decided to play in pacifism mode for any sandbox missions. I play a lot of tower defense and RTS games. The key to defense, in almost every RTS game / Tower Defense game, is recognizing the square-law with regards to waves. If one-turret can survive 1-wave before being destroyed, then 2-turrets will survive 4-waves. 3-turrets will survive 9-waves. 4-turrets will survive 16-waves. 10-turrets will survive 100 waves. Etc. etc. etc. This is because DPS combos with DPS. The more you kill enemies, the fewer attacks enemies make against you. The quadratic law can be roughly stated as: Twice the defenses will survive Four times the attacks. Factorio of course (Lasers + Guns vs Spitters). But also Starcraft (those "critical group size" for marine-balls or whatever), Axis and Allies, and even D&D 3.5 / Pathfinder. (where the quadratic law finds itself in the XP Chart / CR table). This law holds until turrets can't "cover" themselves anymore, which is as soon as you have 1-layer for gun turrets (Spitters have approximately the same range as gun turrets), and roughly 4 layers of laser turrets (where Spitters will hit the first layer of turrets, and the 5th layer of turrets will be "too far away" to help). Of course, walls and defensive combinations can change things (especially water). The combination of Biters + Spitters also makes the calculations difficult (Biters always "tank" for the Spitters). So the above "quadratic law" is a gross estimation. But once you understand how DPS prevents damage, which allows your DPS-structures to provide even more DPS for longer periods of time... (which ends up being, roughly quadratic, in terms of power)... you become a much better player in a huge number of games. 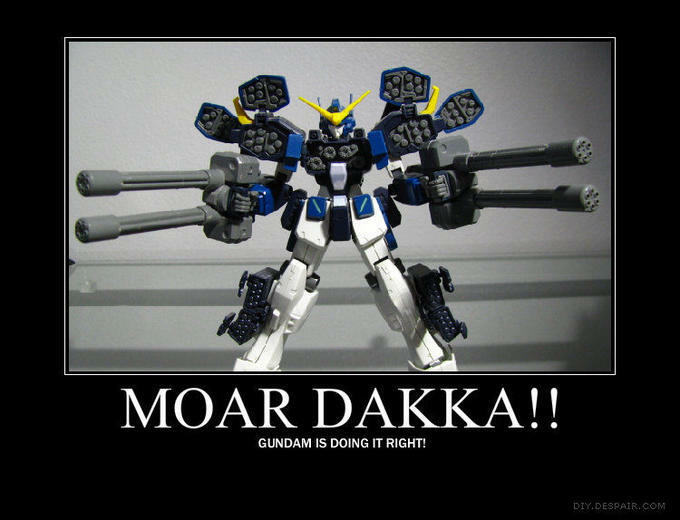 I guess what I'm saying is... the solution to the problem is more dakka. Its a game about automation after all. Just build more guns and automate them all. That is, build more belts to cart Piercing Ammo to your guns (upgraded to max), or build more solar panels to power your lasers. Or both. And I know that 1-layer of piercing guns + 1-layer of lasers is enough to kill behemoth biters almost instantly in my Megabase (guns have the most endgame DPS in this game. Lasers have more range however). Build a roboport near your turrets. Have an assembler dedicated to repair kits, exporting to the logistics system. Factory repairs itself. Also you can have your piercing ammo assembler (s) dump to the logistics system and have bots carry to your walls, in case you don't like having a maze of tracks supplying everything. CorruptUser wrote: Another trick is that enemies don't build bases within 3 map-squares of a building. AI was changed in 0.13. This trick doesn't work anymore. Blegh. I think that means that instead of small poles, you need a series of small nests of laser turrets to kill the 6 biters that run to found a news base? CorruptUser wrote: Blegh. I think that means that instead of small poles, you need a series of small nests of laser turrets to kill the 6 biters that run to found a news base? Actually, I just have ~100MW of turrets (Huh, I'm at 4000+ laser turrets already??) running around my entire base (plus Gun Turrets for more DPS). But back when resources were scarce I used the Gun Turret + burner inserters + wood + PIercing trick. Two solid stone walls, Piercing Round bullets for DPS, Laser turrets for range, roboports for automated healing, and a train station to deliver supplies regularly to all of my walls. Base expansion blueprints for me consists of a substation with 12 batteries in a cross and 16 solar panels in the corners. Plop a few down and personal roboport builds it instantly. Some people like pure dedicated batteries and pure dedicated solar panels, but meh. I'm not sure why it took me 24 hours on a peaceful map (67h overall playtime) to launch my first rocket, but there it is. The biggest bottleneck was red circuits, which in turn can only be scaled up if there's enough oil and the entire oil chain is an annoying hassle. Just getting the raw oil to the base with this barrel nonsense is annoying enough, but having to balance all the derivative products to ensure most of it ends up as plastic is even more annoying. With iron/copper/stone/coal you just connect new patches via train/belts, scale the smelting subfactory up a notch and that's it. Well, time for mods now! Complete redesign of science recipes. There are now 7 types. GUI updates, including being able to build and blueprint from the map. There was a complete list on reddit, but it has apparently been deleted for some reason. Removal of Alien Artifacts sounds like a very welcome addition... but its a Band-Aid fix to the tedium that is the current combat system. Something is wrong with combat in this game: its far too difficult early on, but then becomes very easy once automated "pods" start doing the majority of the combat for you... but then it becomes tedious instead of fun at that point. The science thing is a great idea IMO. 7 is a rather difficult number to hit, you'll need four lanes of belts to deliver science efficiently (or put science on the logistics network I guess). More importantly: it means that rocket launches actually create science for later upgrades. Nuclear power helps solve the issue with boring power-generation (Many many many fields of solar panels). Boilers are more interesting and fun to play with IMO since you actually have to manage resources around them. Nuclear Power can make them a feasible alternative to Solar. Liquid Wagons intrigue me. I'll have to play with it. That clearly allows for more flexible train systems. 1. Map generation settings are simplified and streamlined to the popular "Reddit" mods and games. "Death World" for difficult biters, "Marathon" for far more difficult building. "Rail World" settings was incredibly popular on Reddit: lower biter settings but resources are much further apart for Railroad lovers. 3. Red and Green science remain exactly the same. Level 3 science has been split up into four different kinds of science (Advanced, Military, Processing, and... something). With yet one more final science being from the "Rocket". 4. Oil Yields are wayyyyyyy up compared to 0.14. Apparently, oil patches are 1/2 as common but provide 2x the yield by default now. So less time exploring for oil, and more time organizing the oil that you do find. 5. There seems to be a science tier available to convert Coal into Heavy Oil now. Coal always needed to be routed to the "Oil Processing" plants of my bases, but now it has more use than just making tons of Plastic. 6. Based on the Reddit threads, it looks like ~9 nuclear reactors get you to a GigaWatt now. Nuclear processing looks incredibly convoluted for balance reasons (mining requires sulfuric acid, U-235 only has a 0.7% chance of being made, and you require a ton of it to make nuclear power. A ton of Depleted U-238 gets made while looking for U-235). In any case, it looks like Nuclear Power is incredibly space efficient, but practically requires a Megabase to get going. 7. It looks like Nuclear weaponry (not just Depleted Uranium shells for endgame minigun... but also Nuclear Bombs) have been implemented. o.O Depending on the blast radius... this could definitely solve the "Clearing out Biter bases is annoying" problem. EDIT: Got to oil. Holy crap, Fluid Wagons hold a lot now. Actually, they grossly upgraded the amount of storage that storage tanks have: its now 25,000 per tank. A fluid wagon contains 3-tanks, for a total of 75,000 fluid. In contrast, 40 barrels will hold 250 Oil each (in 1.4) for 10,000 oil per trip. The Oil-Wagon is easily the best way to transport fluid of any kind. Thank goodness too, since Uranium Ore requires Sulfuric Acid. So you'll need a fluid-tank to transport all that acid around the map. I'm loving the update so far. I've never gotten to the Megabase phase yet, but I think I'll be doing it this time around, without any mods (not even QoL things like Far Reach and Squeak Through, although I might change that since I'm not going for the achievments). For the starter base I was doing a regular main bus until I unlocked the logistic network and am now in transition to a pure bot-based production area with the bus only feeding green circuits and gears before terminating into the PA's resource reception roughly at the center of it. This minimizes the flight time for high demand items such as plates, while I can just plonk down new assembler flowers (pretty layout for four assemblers fed by/into requester and passive provider chests) anywhere in the PA and not worry about where the resources come from at all. The only slightly annoying thing are recipes that require fluids. Those go at the edges of the PA so the pipes don't snake around too much. It's soooo satisfying to stand around while thousands of bots swarm around, carrying things from here to there. Fly, my pretties! Go and smother my enemies! I thought power armor with robot ports was awesome, but working as the director of thousands of bots is even better. Once the PA is complete with an assembler for basically anything, work begins on mining+smelting outposts. I think for science production I'll go with a one-outpost-per-type system. I think the main bus is a neat design, but it's time to experiment with outpost+train designs. Once that is done, which probably takes 30h or something, it will be time for large scale rocket part production. raudorn wrote: Once the PA is complete with an assembler for basically anything, work begins on mining+smelting outposts. I think for science production I'll go with a one-outpost-per-type system. I think the main bus is a neat design, but it's time to experiment with outpost+train designs. Once that is done, which probably takes 30h or something, it will be time for large scale rocket part production. Once you understand how to have multiple trains running around without crashing into each other, build a "personal rail car" to transport you around your bases and outposts. And feed your "personal rail car" with AM3 / Blue Inserters / Filter Inserters / Logistic Bots / Construction Bots / whatever you need to build new outposts. As far as "Megabases" are concerned: Productivity3 + Speed Beacons are real. 4x Productivity on every Assembly Machine3 to reduce the amount of outposts you have to build, Speed Beacons to make them work at full speed again (negating the speed penalty) and also making things cheaper-per-Joule to make. The PA is finished and working quite fine. It doesn't have the highest production rate, but that's fine since I only drop in on occasion to get stuff and also it's easy to scale up the production of any particular item, as long as it doesn't consume the entire resource input. Now I'm working on science, but not yet quite on the scale necessary for infinite research. I have some technologies left to grab before I enter the endgame, so I'm going for supplying around 20-30 labs for now and then, while the remaining tech gets researched, I will work on scaling the factory up for rocket production. I found that doing everything in isolated outposts is seriously annoying. The hassle of walling of biters and ensuring the turrets are covered by construction bots with a replenishing supply of repair packs is the most annoying thing right now. I will probably wall off a large area south and southeast of the starter base and place all science production within, so I don't have to worry about defenses for those. Once I'm going for outposts much further away from the starter base... well, I cross that bridge when I come to it.